Ask 10 experts and you just might get 10 different answers! Look at the American Diabetes Association, weight watchers, or talk to a registered dietitian (or 5) – and you'll end up even more confused than ever. Yep, join the club. Even as a nutrition “expert” with my Masters in Nutrition and being a Certified Diabetes Educator, sorting through research is very cumbersome and can be overwhelming. While there are general healthful principles we should all follow – for instance, avoiding junk food and eating more whole natural foods, the way the principles are applied in a “dietary pattern” may vary from person to person. Below is a very brief synopsis and comparison of a few of the more popularized diet approaches. 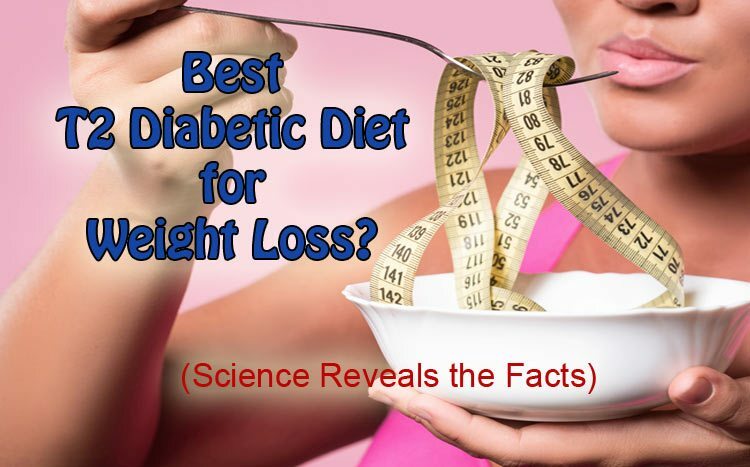 And we'll wrap it all up by trying to examine what the best diet for diabetic weight loss really is (based on the scientific evidence). Low fat diets were all the rage of the 1980s but started making considerable headway even earlier with Dr. Dean Ornish who promoted a diet high in fruits, vegetables and complex carbohydrates and very low in fat–especially fats from eggs, red meat, and full fat dairy. The concept seemed to make a lot of sense in theory: if you want to lose fat, eat less fat, right? Especially the solid “artery clogging” kinds coming from saturated sources. That said, the type of diet adopted by Westerners was very high in simple carbs, high in overall calories and the intake of sweetened beverages skyrocketed–to his credit, Dr. Ornish would never have supported such a diet. A vegan diet is entirely plant-based foods; that is it includes no animal products whatsoever. Those who choose this lifestyle often do so for ethical reasons (animal rights), but many choose it for health reasons as well. This meta analysis summarizing 12 studies showed that those following vegetarian diets for an average 18 weeks lost significantly more weight (about 4.5 pounds/ 2 kg on average) than the control groups, but results were less significant after 1 year (about 2.4 pounds/ 1.1 kg). A vegan diet is almost inevitably higher in carbs and often people following a vegan diet need to take supplements to provide certain nutrients only available in animal products, such as Vitamin B12. Advantages are that if followed veganism correctly, it can be a very high fiber, environmentally-friendly, lower cost diet and lifestyle. DASH stands for ‘Dietary Approaches to Stopping Hypertension.' It was developed by the National Institutes of Health. 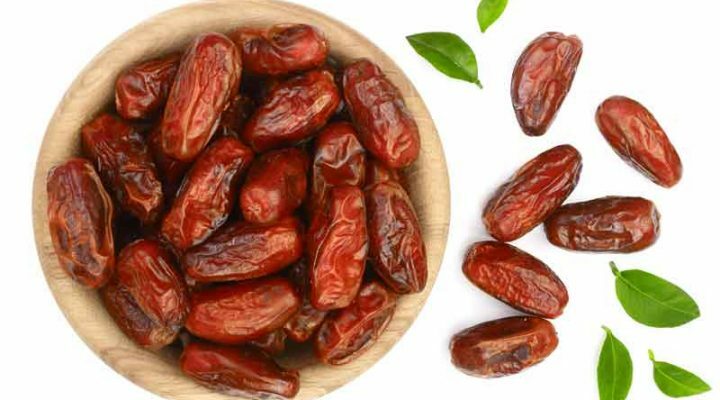 While originally designed to help people reduce high blood pressure, it has since been touted as an effective diet for weight loss. However, you could easily consume a LOT of carbs on these diets – breads and potatoes in the same meal, more sugar, juice…along with cereal and bread for breakfast. For diabetics this is going to stack up your blood sugar and A1C and in turn you won't be getting great weight loss results. That said, there is much evidence to support the notion that a low carb diet is more effective for weight loss than low fat. One study among the obese (39% had diabetes) showed a weight loss of 12.8 pounds/ 5.8 kg for those on a low carb diet compared with 4.2 pounds/ 1.2 kg on the low fat. 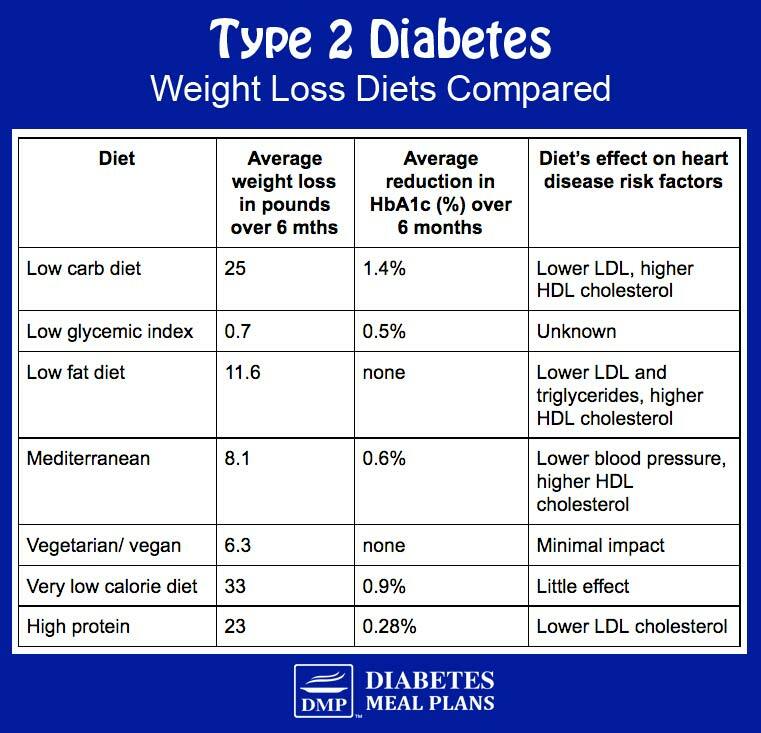 Another study showed greater weight loss in those with type 2 diabetes on a low carb diet, 14.6 pounds/ 6.6 kg vs low fat, 4.6 pounds/ 2 kg; however it was very small study (only 13 people in each group) and short (only lasting 3 months). This larger, 2 year study compared a low fat, Mediterranean and low carb diet and found a moderately better weight loss with the low carb group, 10.4 pounds/ 4.7 kg compared with the others, 6.4 pounds/ 2.9 kg in the low fat and 9.7 pounds/ 4.3 kg in the Mediterranean group. This short 6 week (but small study) showed that a low carb approach was more effective at producing weight loss than the low fat group – 14.1 pounds/ 6.3 kg in low carb vs 9.3 pounds/ 4.2 kg in low fat group. It was also effective at reducing hunger. A one year study comparing low fat to low carb diets on weight and glycemic control in type 2 diabetics showed similar results in both weight and A1c reduction with a slight improvement in HDL seen in those in the low carb group. Another study comparing the 2 diets found greater weight loss with the low carb group (7.3% of body weight) than the low fat group (4.5%) for the first several months but a year out, no difference was seen. This study basically found the same thing. Obviously we’ve seen the weight of evidence support the low carb approach, which is why we encourage it on our site. However, realize that there can be drawbacks to a low carb approach. Just as with any healthy diet approach, people can find loopholes. Remember how people who were all on board with the low fat approach simply replaced their fats with sugar or refined carbs? If you follow a healthy low carb dietary pattern with a balance of protein, fats, and carbs, namely LOTS of fresh non starchy vegetables (like the type of diet we encourage here and in our weekly meal plans), then low carb is the clear winner in terms of the best diabetic diet for weight loss. So, What’s the Overall Verdict? 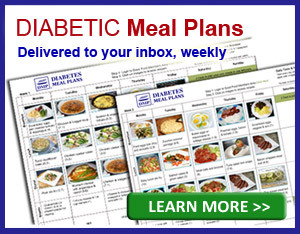 Which is the Best Diabetic Diet for Weight Loss? Answer: the one that works best for you. While we advocate a “low carb” approach here at Diabetes Meal Plans, if you are able to maintain a healthy weight, controlled blood glucose, and sustain energy on one of the other options and prefer that, by all means, go with what works best for you. Still, while we do encourage a healthy low carb approach, in the end the best diet is the one that works best for you – the one you're going to stick to as an everyday way of eating! What has worked well for you? Let us know by leaving your comments below. Need help eating well each day and each week? 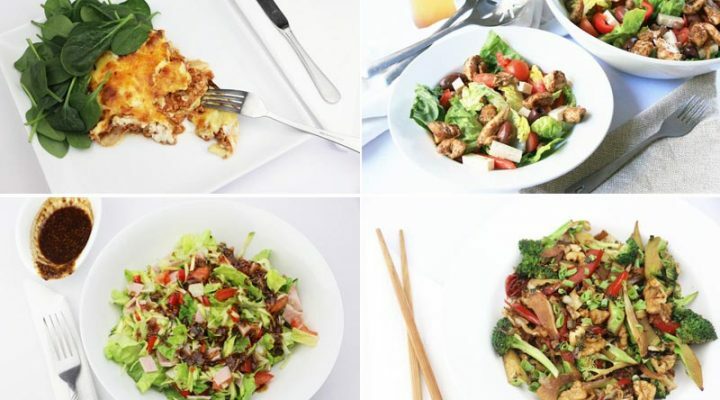 Check out our delicious weekly low carb meal plans. This info on weight gain here will be of benefit to you Sue. As for DMPs meal plans, the calories per day does vary. The plans provide lunch and dinner fully planned, with a breakfast and snack selection you can add. You can learn more about the plans here. Great post with lots of information. I am trying the low carb and so far is working. I have the occasional bloating so I am not sure if it could be caused by certain foods. The meals that are coming up for me to see are often meat based. That’s what I meant – sorry if I wasn’t clear. I did highlight “vegetarian” when I registered. Oh right yes, thanks for making that point! I lost a lot of weight and cut tablets in half by replacing half my meat with pulses like chickpeas etc. Great to hear Valerie – beans and legumes can be a good alternative to meat. They are full of fiber. 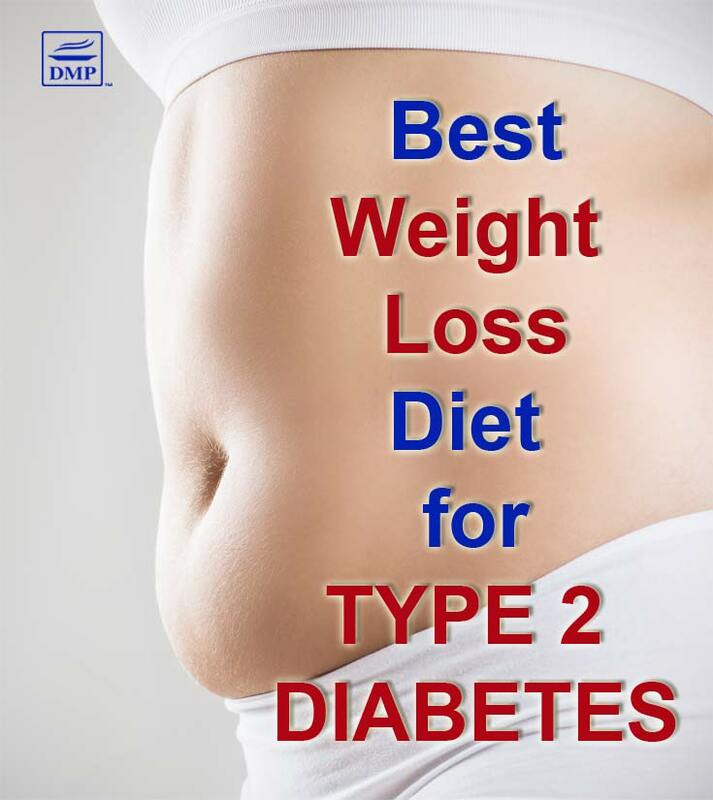 Still, some people with type 2 diabetes and prediabetes can’t tolerate a lot of them, as they are also quite high in carbs. But in small portions they can be great! I have lost 8 kilos. I am limiting my calories to below 1500 often closer to 1200. I’m averaging less than 50 grams of carbs per day. I am thrilled with my results. I am concerned however that I am missing nutrients or eating too much protein. Congrats! Great results Ellen – yes, a lower carb diet does work! And it is also a sustainable way of eating long term, which is even better. Did you learn about low carb from DMP? Various nutrients are found in all types of whole food sources, including fats and all your veggies. As long as you’re including plenty of variety, you should be okay. I’m thinking of subscribing to your meal plans but haven’t worked out the “vegetarian” bit in your plans. Many have meat based recipes. Yes, with being online it can get confusing. But the most important thing is that people find the help they need, help that can really make a difference! What don’t you understand about the “vegetarian” plans? You mean, most low carbers are meat eaters? With meat-based recipes? It is true, that is the case, but we like to add variety. 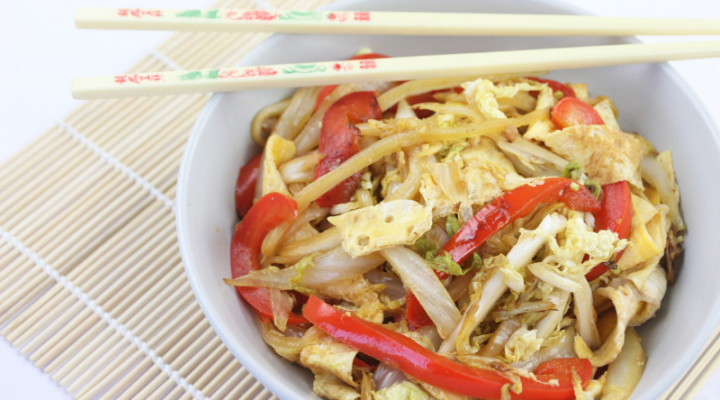 And even some of our members who are meat eaters, like to eat vegetarian recipes sometimes. If that doesn’t clear up confusions, please let me know because other people likely have the same questions. Thanks! I reduced my medicine intake by 50% after having 45-60 minutes regular exercise coupled with low carb diet for 3 months. My A1C reduced to 5.7 from 6.4 and my weight is in the normal range. so, I advice people with type 2 diabetes to try this. Congrats Tsegazeab! That’s exactly why we encourage a lower carb diet – it works! That’s what we encourage here Cathy, because it definitely produces great results – our members and subscribers can vouch for that too! Great to hear you’re in better health. You have never mentioned fasting as a way of controlling obesity and blood sugar. I refer to the work done by Dr. Jason Fung, his books and his youtube presentations. Do you have any thoughts on this? you can find research/evidence to support just about anything depending on how studies are designed, but based on the weight of research and clinical practice, I’d not recommend it to people although as a spiritual discipline it can hold benefits–but even then, precautions should be taken & discussed with an appropriate practitioner. It can be tough when you have to avoid certain foods so I guess the best question is what foods don’t make you react? Are there certain meats and vegetables that seem to be fine? Eat more of those. This is great information. the only problem for me is that I am at work all day and I don’t cook as much now that my kids are out of the home now. I dont stock food and mostly buy as I go.